Canada's central bank has cut its key interest rate from 1% to 0.5%, a record low, as it tries to stem the effects of the global economic downturn. Canada has been hurt by the recession in the US, its biggest export market, and the decline in commodity prices. But the bank said that Canada should recover quickly once the financial system stabilises. The Bank of Canada also signalled that it may have to use more unconventional policy measures to boost credit. The US and UK are also considering quantitative easing to pump more money into the financial system as interest rates near zero. Analysts were surprised that the central bank was prepared to take bolder action to boost the economy. "(This) suggests the Bank of Canada is very serious about this situation and it recognises it's probably been a little too optimistic recently in terms of the outlook," said Eric Lascelles, chief economics and rates strategist at TD Securities. Canada has cut interest rates by four percentage points since the cost of borrowing peaked in December 2007. 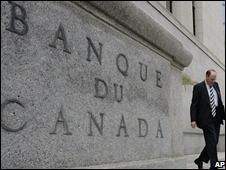 The Bank of Canada said that Canada's economy would not recover until the global financial system had stabilised. It said that steps taken by other countries to recapitalise banks and address the problems caused by toxic assets would be critical. "Once the global financial system stabilises and global growth recovers, the underlying strength of the Canadian economy and financial sector should ensure a more rapid recovery in Canada than in most other industrialised countries," the bank said in a statement. Canada's banks have proved resilient to the economic downturn, generating profits while some of their counterparts in the US and UK have seen massive losses and write-downs. On Tuesday, Bank of Nova Scotia, Canada's third-largest lender, reported quarterly net income of 842m Canadian dollars ($653m, £465m) while rival Bank of Montreal reported a profit of C$225m.